Welcome, party members and onlookers! Last edited by jkat718; 2016-01-29 at 02:46 PM. I often post from mobile, so feel free to correct any typos. The exact contents of the spell scrolls are TBD. All I want/need is full plate. Failing that, the next best heavy armor. I have a LOT of Homebrew! Current Avatar by Elder Tsofu, who is awesome! Spoiler: Avatar (Not In Use) By Professor Gnoll! Spoiler: Avatar (Not In Use) By Cdr. Fallout! If you sell off all the gems and split the money evenly, you'll each get just about 500 gp. Add to that the 37.5 gp you'd get from selling your Chain Mail, and your starting money (which I don't see, so I'll assume is 10, like the Soldier (Chef) Background), you get 547.5 gp, which is enough to buy...a Breastplate. Sorry, but I wouldn't bet on upgrading your armor, JNA. Hey, giving me armor is an investment for everybody. Is this where I say thank you choosing me to play? Looking forward to it!! If you live for people's acceptance you will die from their rejection. Remember, no matter how hot she is, someone, somewhere is tired of her crap. Your passive Perception score is 12, not 11. Fixed. Your max HP is 32, not 20. Fixed. You have 10 gp, not 11. You have 2 more daggers: 1 from the Sage Background, 1 from the Scholar's pack (I allow the "small knives" to be replaced with daggers). Fixed. Your max HP is 43, not 37. Incorrect. Could you write out for me what the Chef Background has? It'd make it a lot easier to double-check your sheet. Thanks! BTW, I really love your weapon names. You have proficiency with Religion due to a house rule. You have 2 1 more Skill Proficienciesy: Athletics and Intimidation from the Soldier Background, Athletics again from Soldier due to a house rule (which means 1 of your choice, as per PHB, p. 125), and 2 more from Fighter. I'm assuming your starting array was 15/13/13/10/13/9, which went to 16/14/14/11/14/9 due to the Human's racial Ability Score Increase, and then you added 2 to Wisdom with your ASI. If that's the case, you had one more point to spend after Point Buy. Without redoing other ability scores, you can only bump up Intelligence or Charisma. Personally, I'd recommend Charisma, but that's just because I hate leaving negative modifiers be. Aw, thanks! I am, too. Last edited by jkat718; 2015-11-02 at 08:32 AM. It grants Animal Handling (sheparding the meat), Survival (improvised cooking), Cook's Utentsils (for cooking), and Poisoner's Kit (for knowing what NOT to cook) proficiency. You're able to whip a meal out of seemingly thin air. So long as you have Cook's Utensils and anything vaguely resembling food, you can make enough food to feed up to five people. Last edited by JNAProductions; 2015-11-01 at 08:19 PM. I see 6 healing potions. Give the best one to one of the Fighters, and everyone else gets a normal one. I would advise the two fighters should take the potion's of hill giant's strength, but it's useless on both of them. I don't mean to toot my own horn but Amy is probably the best one to take the Wand of Magic Detection because Aelar already has it as a ritual. There's 1210 gp in coins and 2990 gp with gems and artwork taken into consideration. We can very easily get plate for one of the fighters and splint for the other, but getting plate for both requires a bit more financial creativity. Selling the chain mail of both is one such option. I would like Scale Mail to be less squishy. Your max HP is 43, not 37. Last edited by Ghost Nappa; 2015-11-01 at 08:55 PM. First of all, Warthog will speak in Brick Red, and here's all his stuff. So here's Warthog "Orcbowler" Hammersmith, Sargent in the dwarven army. Infantry extraordinaire and all around crazy dwarf. He doesn't tend to think, but more so just runsrolls into situations hammers a blazing. Warthog was born to a family of dwarves that were smiths, brewers, and soldiers. Warthog's father was a soldier and a brewer, and his mother was a soldier and a smith. Luckily for Warthog, he was taught both trades by his parents growing up and while he didn't master either of them, he is very good at both. Like his parents, grandparents, great grandparents, great, great grandparents....starting to see the pattern now? His family is an old family that is well respected, so of course when Warthog got into the army, there were very high expectations. Luckily for him, he had been trained by his parents before going into the actual army, so he did have a leg up. But he had such a natural talent for combat and being in the military that he rose quickly. In fact, he found his niche style of combat....Warthog seemed to just love running right in the middle of his enemies and either bowling them over or keeping them occupied at his allies caught up. The only problem was he kept getting overly hurt in training due to all the enemies converging on him. They found a solution. Warthog had armor made for him that covered every inch on his body, save for a place on his helmet that had a hole for his face. 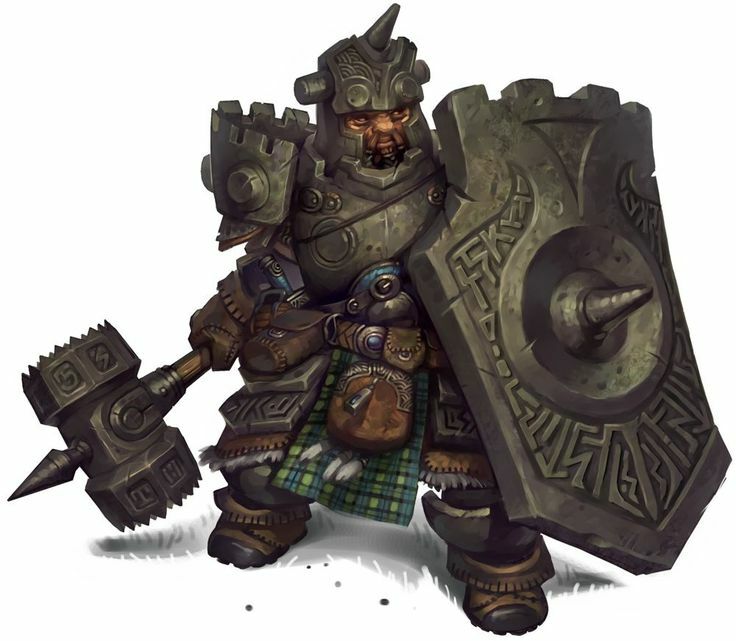 He also had it made, along with a shield that was pretty much as big as he was, so that he could actually roll himself into his enemies like a giant boulder, knocking them down and him springing back up ready to deal out some damage. Once everything was built and his technique perfected, Warthog was almost unstoppable. After that Warthog rose quickly to Sargent and led an infantry division during combat. Time and time again orcs would try to raid their cavern kingdom, but they never did break through, much of the thanks lies with Warthog and his men. During one such raid an orc got a lucky strike on Warthog and he wasn't able to walk at all. Instead of listening to his orders and running away, his men formed ranks around him and drove off the orcs long enough for clerics to get to him and take him back behind the wall. The whole time his men stayed around him, refusing to leave him behind. He was later healed and was fine, but the experience stuck with him and from that point on, he never left a man behind, despite whatever odds he faced. Warthog grew as a soldier and had many battles to his name in which they came out victorious. His clan and his people were the most important thing to him, and he will never stop fighting nor doing whatever he needs to to protect them. You have 2 more Skill Proficiencies: Athletics and Intimidation from the Soldier Background, Athletics again from Soldier due to a house rule (which means 1 of your choice, as per PHB, p. 125), and 2 more from Fighter. Last edited by Irish Musician; 2015-11-02 at 09:15 AM. My Extended Signature, Check it out! Made by the awesome Wartex1! Also, your AC is off. You should only have 20, Irish. Last edited by JNAProductions; 2015-11-01 at 09:05 PM. @Ghost Nappa: My math was using a d8, not a d6. Mea culpa. 16 (Chain Mail) + 3 (Large Shield) + 1 (Defense) = 20 AC. Last edited by jkat718; 2015-11-01 at 09:54 PM. Many a years have I lived, and I have little need for gems or gold. Spare me nothing save a bit of gold , but leave me with the scrolls. It won't do you young ones much good, anyway. Wizard scrolls I will scribe into my spell book, depending on available money. Whatever spare cast I have, I will spend on casting magic mouth. Will consult the DM on this. 10 gold I will spend on summoning a familiar. jkat718, how are the scroll contents decided? Also, is there any pre-adventure setup time, or can I only begin the above preparations after the adventure begins? Assuming I'm not ninja-ed, Aelar will take navy. Last edited by lordshadowisle; 2015-11-02 at 06:14 AM. My idea was to wait and see if I was chosen then to see about collaborating on languages. Since Ghost and Snow and I are already somewhat doing that are there any languages you two have that we can share? Barring that not working out I would assume common and elven I guess. Last edited by Lioslaith; 2015-11-02 at 07:29 AM. Whatever is left over from the magic items and gold I'll be fine with. As the designated fulfiller of the Smurtette Principle, I will be extremely unoriginal and pick Pink so that no one has to waste time trying to figure out who I am. Major Tom to Ground Control, do you read me Ground Control? If no one else has claim to them, Jack will accept the Ointment and Helm of Comprehend Languages. He has no desire of monetary gain except to help him further his goal of eradicating evil. If any objects will help him do that, he'll accept those, as well. Jack will take Teal for his color. If JNAP and myself can grab 200g each for Splint, that will help our AC's definitely. Neither of us have a Dex bonus, so medium armor won't do us any good. That being said, Warthog doesn't usually need much in the way of money or magic items. As long as he has some gold for ale, he's happy. Jack will be healing a lot, I think. That's why Irish and I should each get Full Plate with the money we have at our disposal. Much less healing needed. That being said, even just Splint would be nice. Last edited by JNAProductions; 2015-11-02 at 09:19 AM. We would only have about 2500g total, so if everyone else wanted to pitch in and you wanted to liquidate your gold, you could get some plate. I am personally fine with some Splint, because even though we'll only be at 21, we got some healing pots we can have as well as our normal healer. And if we sell our chain, then the splint will be a little cheaper. I don't agree with giving both fighters full plate, since Amy (Ghost) would benefit more from having good medium armor (+4 AC improvement). We can do 1 plate, 1 splint, and 1 breastplate, which comes out to 2100 gp. The remaining money can be used for other useful purposes. PS: I would support a random contest to determine who gets the plate. Last edited by lordshadowisle; 2015-11-02 at 09:47 AM. Sounds good. Irish, want to do a roll-off to see who gets plate? I, uh... Think I win plate. Last edited by JNAProductions; 2015-11-02 at 09:46 AM. @ghostnappa So are you good with Amy sort of serving as Zane's conscious or grounding force in his life? Even if he doesn't want to admit it? I'll speak up for the wand of secrets and the potion of climbing if no one else wants them. @jkat a question, is the healing going to work per RAW? Last edited by Lioslaith; 2015-11-02 at 11:32 AM. Again, we could certainly give them both full plate but I don't think we should. It's too pricey for us to be able to afford both and have money for other contingencies and such. I think I only need 75 gp for Scale Mail and Thieves' Tools (I guess that's my job since I can use them?) I've got a couple of extra daggers that I have no plans on using but that's only 4 gp that can be freed up. @lioslath I'm perfectly fie with that although I'd still like to be able to see your character sheet. Can you make it viewable or offer me permission to see it? Sure thing, I think if you click on it it sends me a request? If not I can make it public I think, I'm pretty tech challenged. @jkat I had a couple of ideas, all fluff, no real mechanical benefits to the character but it may be too Mary Sue. What about Zane/Sebastian being immortal? Or possibly on the cusp of realizing he is immortal? Too mary sue? Last edited by Lioslaith; 2015-11-02 at 01:15 PM. Splint is fine with me. I'll update my sheet, then.